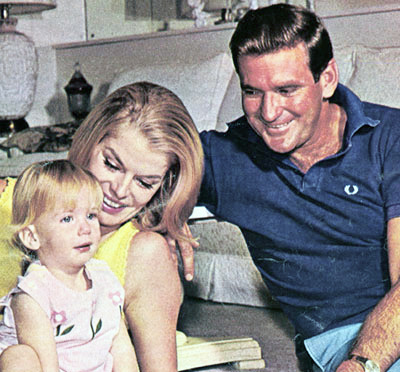 Fan magazines of the 1950s and early '60s chronicled Rod Taylor's wild life as a very eligible Hollywood bachelor. His romances with many a starlet -- particularly actresses France Nuyen and Anita Ekberg -- were reported in great detail. This Web site, however, will focus on the more domestic side of Rod. 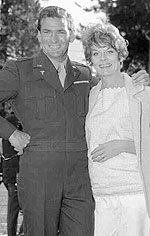 Although Rod and Carol were married in 1980, their relationship dated back to the early 1960s. 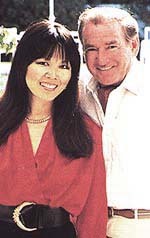 Carol, who was born in San Francisco of Japanese parents, admitted: "I never forgot Rod. He was the one man in my life I thought of the most. Then one night in 1971 I saw him on his new TV series 'The Bearcats.' I decided to find out once and for all if Rod was the wonderful man I dreamed he was. "I phoned CBS and left a message. I wanted Rod to decide whether to return my call. He phoned me back -- and I was overjoyed." She flew from Las Vegas to Hollywood, where she and Rod returned to the same restaurant that they had gone to on their first date. "I wined and dined her with all the charm that I could muster. It was an evening that dreams are made of. It was amazing. Nothing had changed about her and we started where we had left off." After that idyllic night, the couple dated steadily, although business interests often kept them apart. "I suddenly realized how much I loved her when we attended Alfred Hitchcock's 75th birthday party last August. There was something magical about that night, and it made me see how much she really meant to me. She's highly educated, fun, very mature and self-sufficient." Said Carol: "We don't need a lot of people around us and we enjoy each other's company. We play lots of tennis and we cook and paint together. Rod's a fantastic painter. "He's so honest and thoroughly amusing. He's all the things that a woman seeks in a man -- all the gentle, mushy things. He remembers dates and everything. Rod is not the typical Hollywood actor." See more about Carol in Rod's "60 Minutes" appearance. 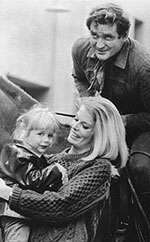 Felicia Taylor entered the scene on Aug. 28, 1964, while her father was in Ireland, filming "Young Cassidy." Rod raced around the world to greet his newborn daughter at Cedars of Lebanon Hospital in Hollywood, Calif. Most recently, Felicia was an anchor-correspondent for CNN International's "World Business Today" and also one of the hosts of a special digital/social media feature for CNN called "Leading Women." 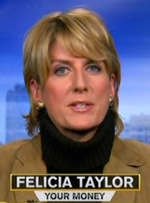 Felicia previously reported business news for CNN from late 2006 until becoming the co-host of Retirement Living TV's "Daily Café," a 90-minute program produced in Washington, D.C., a position she held through November 2008. Felicia's resume also includes being co-anchor of the 6 p.m. and 11 p.m. news on WNBC-NewsChannel 4 in New York City, from September 2003 to September 2006. She originally joined the TV station in October 1998 as the co-anchor for the station's weekend morning news program, "Weekend Today in New York." According to her WNBC bio, Felicia previously was at CNBC and was a London correspondent for the Financial Times. She also has worked as an anchor, producer and writer for Financial News Network. She holds a bachelor's degree in communications from Northwestern University. Felicia's two sets of godparents featured great directors -- Mr. and Mrs. John Ford and Mr. and Mrs. George Marshall. See more about Felicia in Rod's "This Is Your Life" appearance. I first saw this woman across a crowded room, exactly as it says in the song, and the minute I could get anywhere near her, I turned on every charm, every trick I'd learned through my long and fruitful bachelor years. ... I poured it on -- and was intrigued by this statuesque blond who didn't react with so much as a lift of an eyebrow. ... No female in memory had ever failed to make some response to my gamut of long deep looks, engaging winks, toothful smiles. Not long after, I found out that ... Mary is as short-sighted as an owl. She simply couldn't see me. 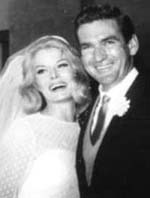 They wed on June 1, 1963, when Mary was 27 and Rod was 33. Attorney Greg Bautzer was best man, and Rod's agent, Wilt Melnick, gave the bride away. The 30 guests included John Wayne, Louis Jordan, Jane Fonda, Hedda Hopper, Barron Hilton, Robert Cummings and Vincente Minnelli. Rod and Mary's marriage got off to a shaky start, with two separations and talk of divorce in December 1964, but things were patched up. Their daughter, Felicia, was born in August 1964. 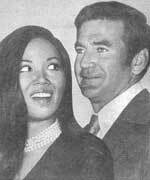 The couple divorced in 1969. 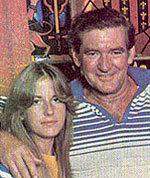 Back in Sydney, 21-year-old Rod Taylor married Peggy Williams, who was even younger. "That was ridiculous," he said in a 1963 interview. "I wasn't mature enough to guide the relationship and neither was she. It lasted three years. I've been trying to grow up ever since." I married at a tender age during my early stage and radio struggles. 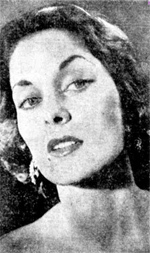 She was a beautiful girl, a top model I met when I was working at Mark Foy's [department store, designing and painting backdrops for window displays and fashion shows]. We were both very young, and the rock we foundered on was strictly a career clash. Thus, Rod was a single man when he left Sydney and arrived on the scene in Hollywood.